Yep, I’m posting another salad recipe. I know, I know….but I can’t help myself. There are just endless way to combine endless ingredients and they all taste insanely delicious. As an added bonus, I find salads are the best sort of whole meal in one dish, making it ideal for my busy life. This is the type of salad that hits all the right notes. 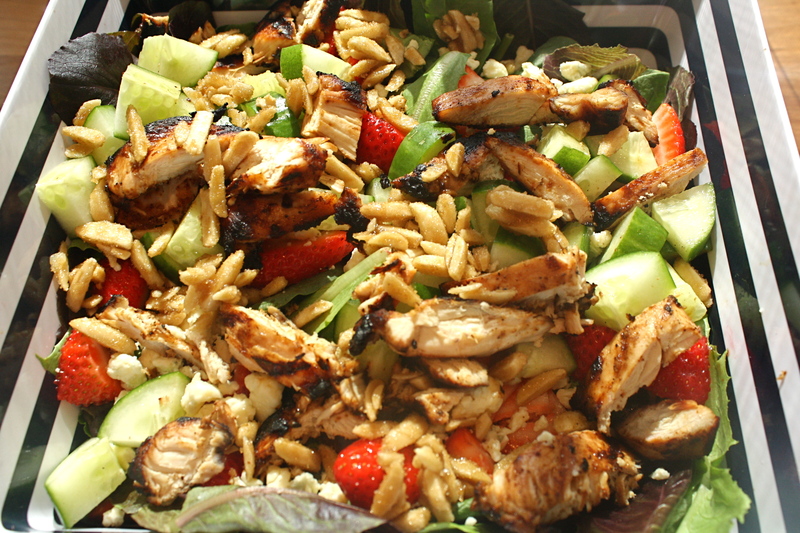 Smokey grilled chicken, sweet strawberries and tangy balsamic vinegar are the perfect combination. Oh, and did I mention there is very little cooking involved? I’ll take that on a hot summer night any day. There really isn’t anything too complicated about the preparation of this salad. You’ll want to start by marinating a few chicken breasts in your favorite Italian dressing. I did this first thing in the morning and refrigerated them until dinner. Grill the chicken on high for about 15 minutes and allow to rest while you are preparing the remainder of the salad. 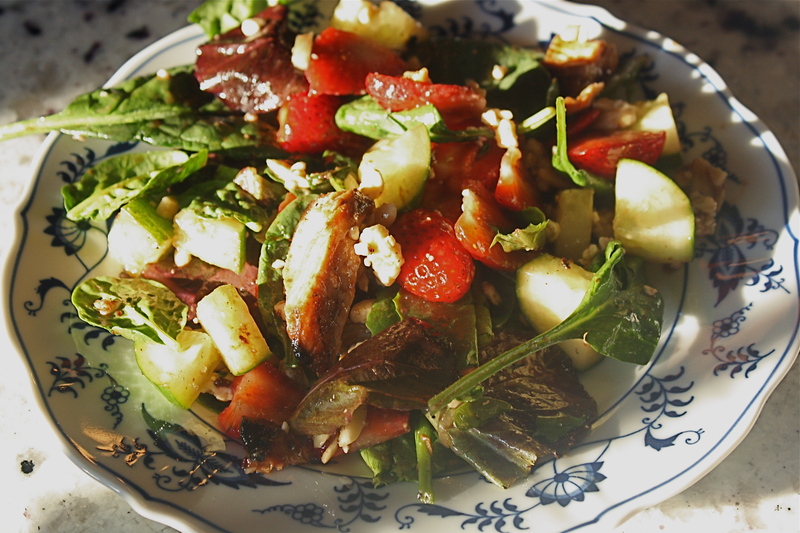 The real little gem in this salad is the strawberries. They are so perfectly ripe this time of year. You’ll want to wash and chop about a cup and a half of these. Aaaannnnd you might need to throw in a few extra in case you can’t resist and need a pre-dinner snack. 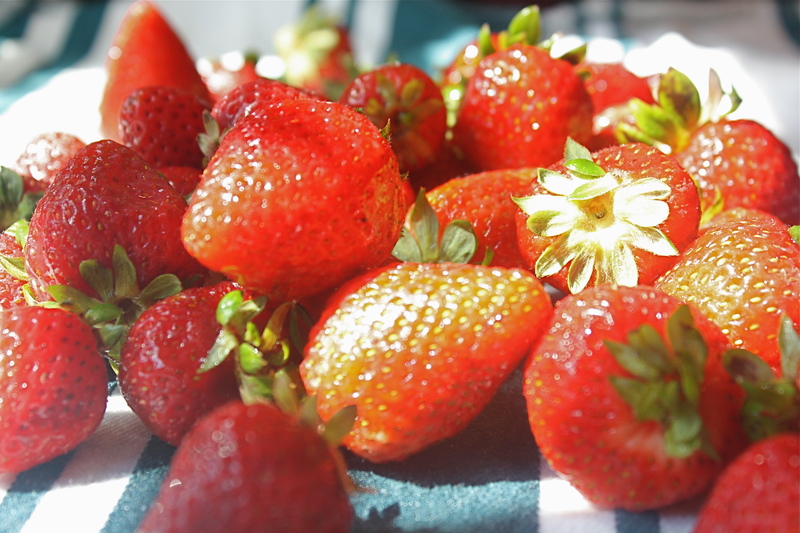 While the strawberries are drying, prepare some sugared almonds. 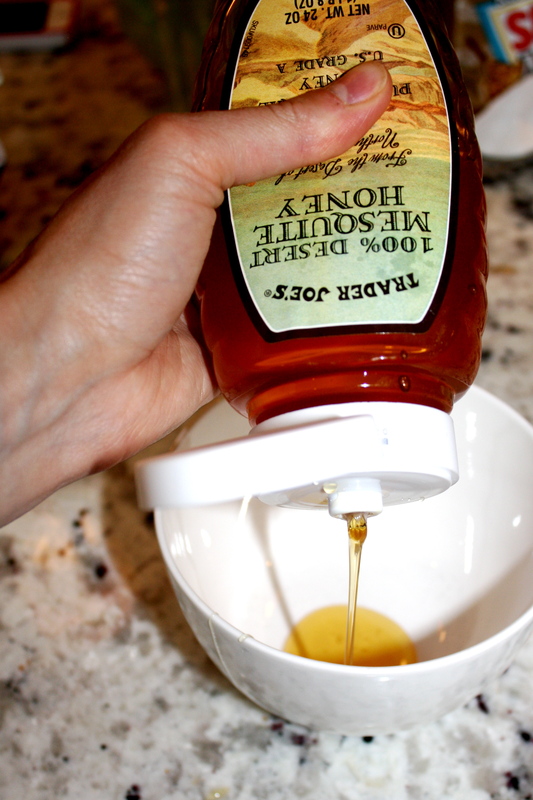 Simply throw a half cup of slivered almond into a pan with 2 tbsp brown sugar and 1 tsp water. Allow the sugar to melt, get bubbly and coat the almonds. Pour onto parchment paper and allow them to harden and then break them apart into small pieces. The rest is simple. Cut up the remainder of your vegetables and slice the chicken. 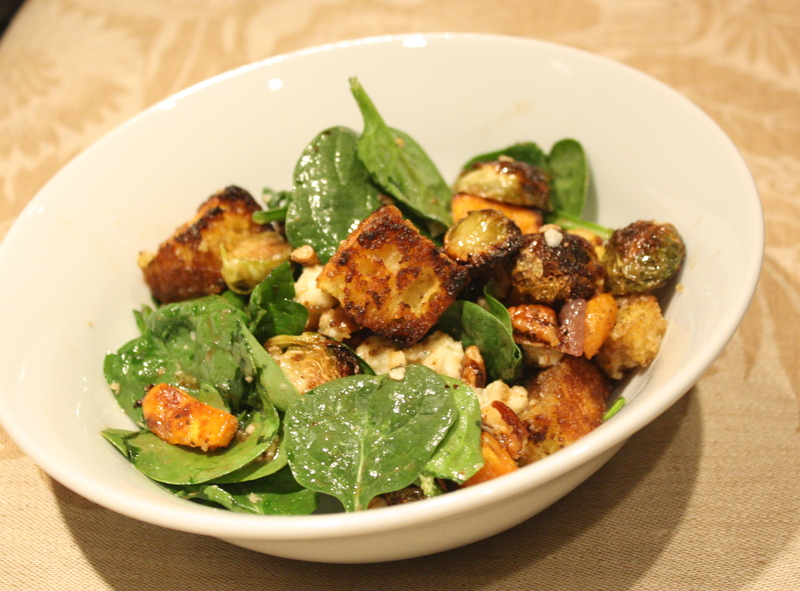 Place all of the ingredients over a bed of mixed greens and toss with a store bought or homemade balsamic vinaigrette. Serve alone as a light main dish or alongside something more decadent to make you feel better about what you are eating. Either way, it’s delicious! 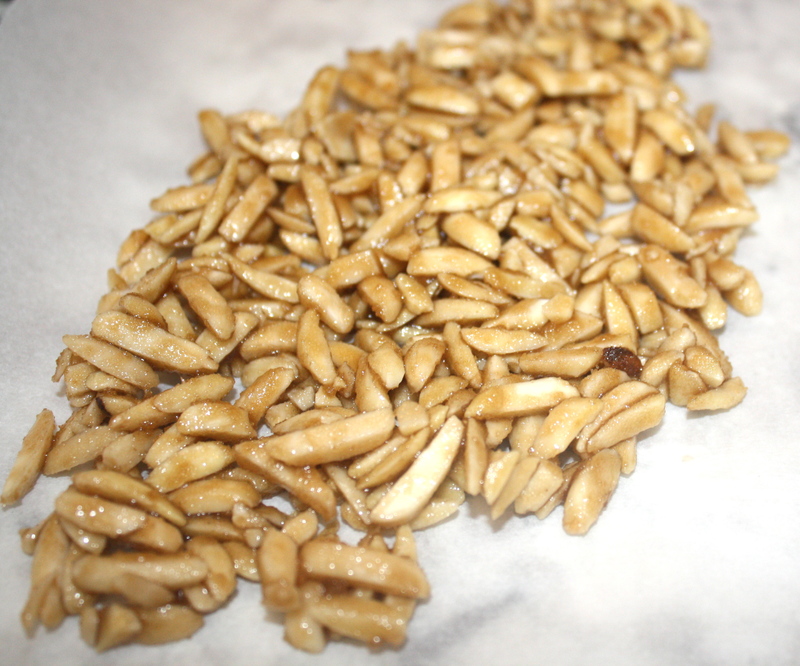 Prepare the almonds by placing them in a skillet with the brown sugar and 1 tsp water. Allow the sugar to melt and bubble until thickened and fully coating the almonds. Pour the almonds onto parchment paper and allow to harden. Break apart and set aside. 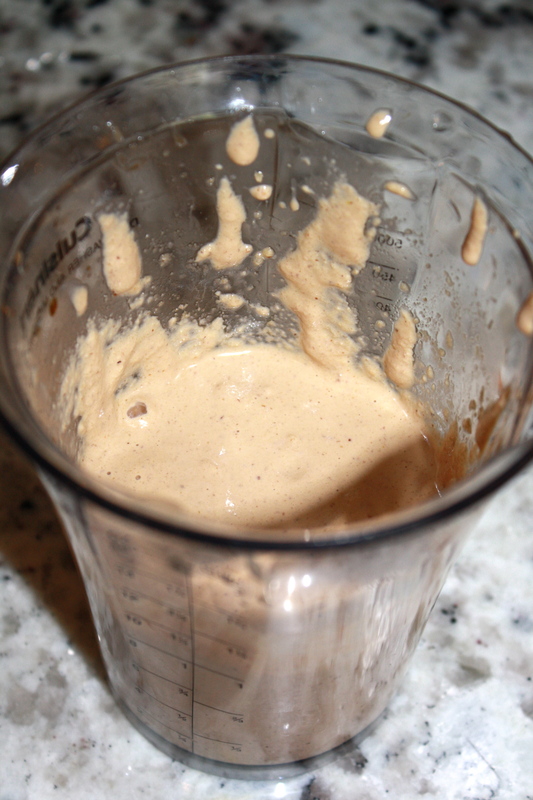 Mix all of the vinaigrette ingredients and shake together until emulsified. Wash and slice the fruit, vegetables and chicken and place all ingredients in a bowl. Toss with the vinaigrette. Alrighty folks….here’s another guest post by my sister. Apparently, this was a big hit with the hubs! Has anyone noticed the price of steak sky rocketing recently!? I have! BUT I have a man to feed who really enjoys the occasional steak so I was trying to think of how to make a steak go a long way without breaking the bank. Now, men are notorious for not really enjoying their daily intake of greens so this recipe might be daunting to the eager-to-please house wife, but have no fear, your man will feel spoiled when he digs into this delicious salad. Plus, you will get to enjoy the results of your labors as well without feeling so guilty about price or calories. Here’s how to make it! 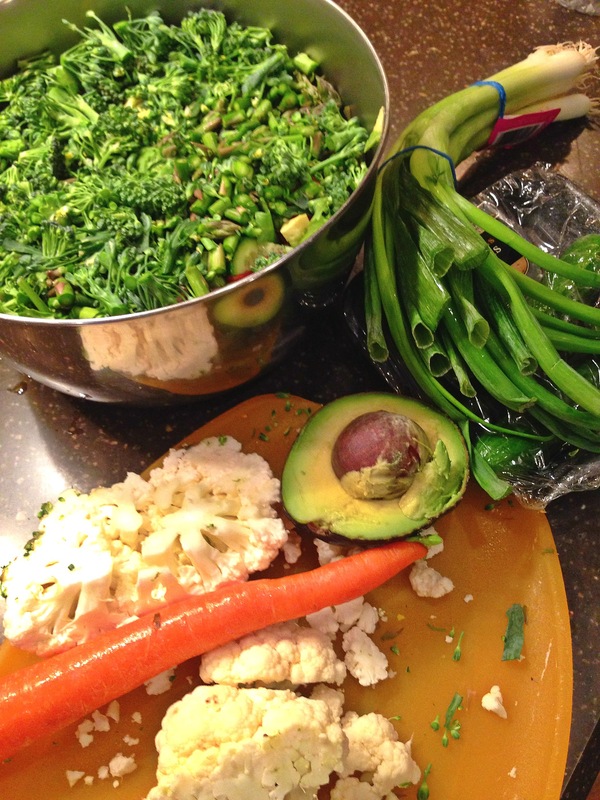 You want to start by chopping all your veggies into small pieces. The lettuce will be the foundation, obviously, so build everything on top of your heap of lettuce in a large bowl. Have your grill and frying pan ready as you will need both for cooking up the steak and the bacon. Tip: Don’t feel limited by the ingredients listed in my recipe; you can add any veggies that sound good to you or try roasting some of the veggies before adding them to the salad. 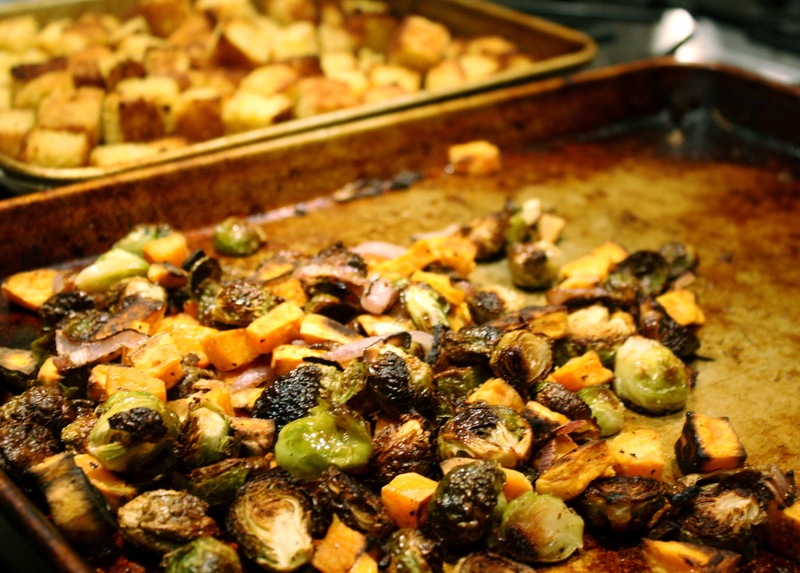 Roasted veggies are a delicious addition to any type of grilled meat. Once the veggies are chopped, you can get started on frying the bacon until crispy. Place the bacon aside, but don’t throw out all the bacon fat. Now comes the fun part! 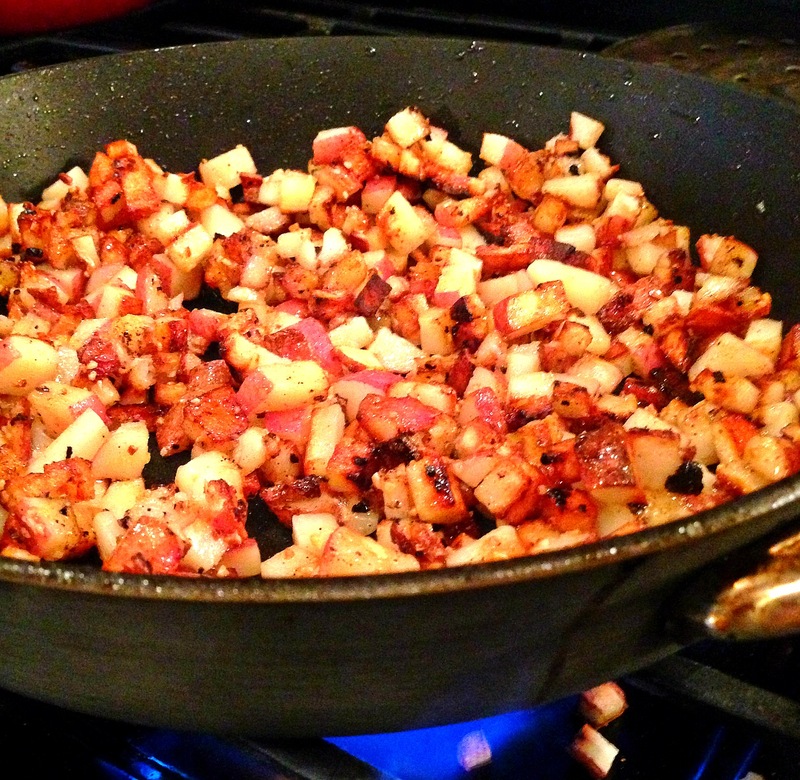 Cut four red potatoes into very small chunks (pictured below) and throw the potatoes in with the remaining bacon fat. Sautee the potatoes on medium heat until they are browned and crispy on the outside. Yum! These will serve as your “croutons” for the salad; good news for all you Gluten Free eaters out there. Now for the star of the show… the steak. I find that over-seasoning a steak is highly unnecessary, so resist the temptation to get too fancy. I purchased a rib-eye steak that was just over a pound, seasoned it on both sides with salt, pepper, and garlic, and had my man grill it to perfection. Once cooked, let the meat rest before slicing it into strips. 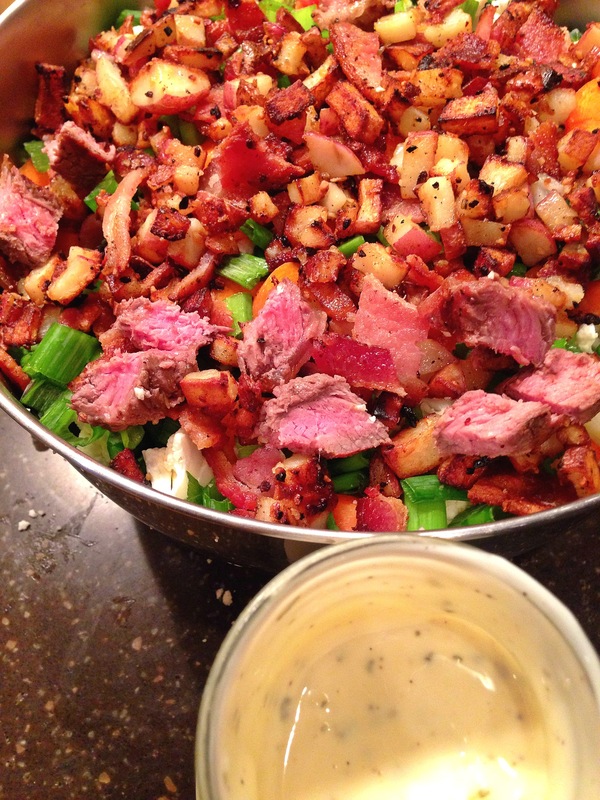 Then, simply top the veggies with the steak strips, potato “croutons”, chopped bacon, and whichever dressing is your favorite. I suggest a healthy homemade ranch, or a balsamic reduction. Eat and enjoy 1 steak for 4 people; what could be better than that!? Season the steak with salt, pepper and garlic and allow to come to room temperature. Meanwhile, finely chop all of the vegetables (except the potatoes) and place in a large bowl. Fry the bacon in a pan until it has reached your desired doneness). 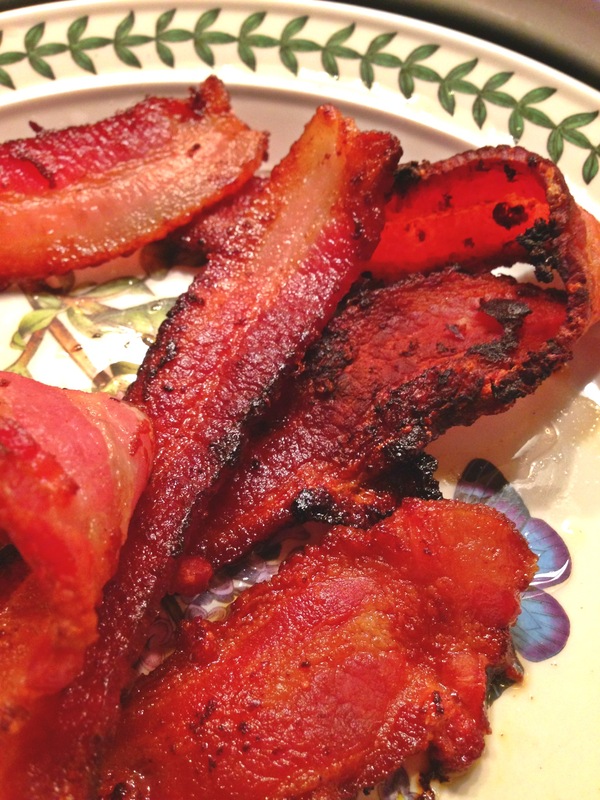 Place the bacon on a paper towel to soak up excess grease and to cool slightly. Chop the bacon and add it to the salad. Drain off all but 2 tbsp of the bacon grease, chop the potatoes and add them to the reserved grease. Saute until tender and crisp on the outside and then set them aside. Place the steak on the grill and cook for 5-8 minutes per side (depending on the thickness of the steak and your desired doneness). Pull the steak off the grill and allow to rest for 10 minutes before slicing it into bite size chunks and adding it to the salad. Dress the salad and top with potato croutons. I have a confession. I am not a fan of brown rice. I feel like I should be because it is the holy grail of health foods, but something about it just says “meh” to me. I keep trying to find a way that I will actually eat it and enjoy it, and you know what, I think I may have hit the jackpot today. This salad is so full of flavor that I hardly even noticed that I was eating brown rice. It has a southwestern flare that works wonderfully as a side dish but has enough substance that it could stand on its own as a light meal. Suddenly, brown rice is looking a whole lot more appealing! Start by cooking the rice according to the package directions. Once the water is fully absorbed, sprinkle the rice with a few teaspoons of vinegar and allow to cool. In the meantime, wisk together lime juice, honey, cumin, olive oil and salt and pepper in a small bowl. This will serve as the dressing for the salad. 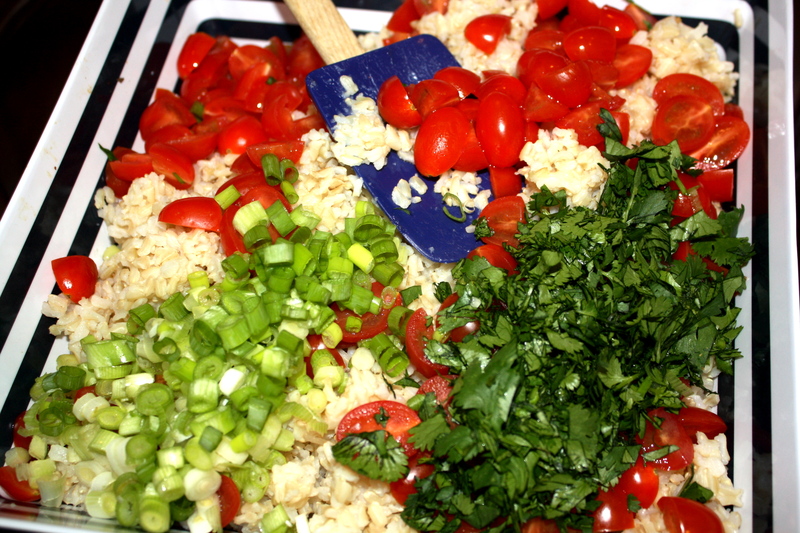 Once the rice has cooled, add some scallions, cilantro and cherry tomatoes to the rice. Pour the dressing over the salad and toss thoroughly to coat the rice. You can store the salad in the fridge for several hours until you are ready to serve it. Right before serving, slice an avocado and add it to the salad. Cook the rice according to the package directions. While still warm, sprinkle the rice with the vinegar. Allow the rice to cool. 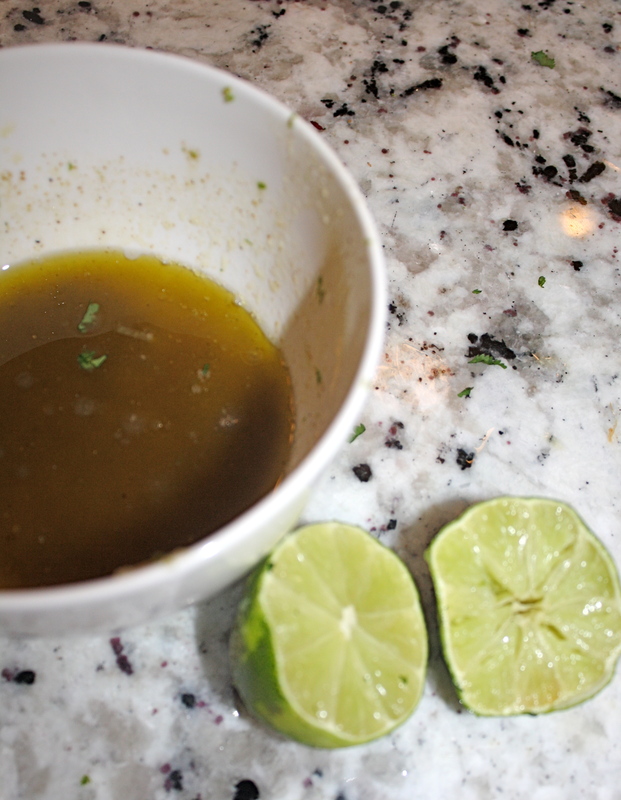 Meanwhile, stir the olive oil, honey, garlic, lime zest, lime juice, cumin and salt and pepper in a small bowl. 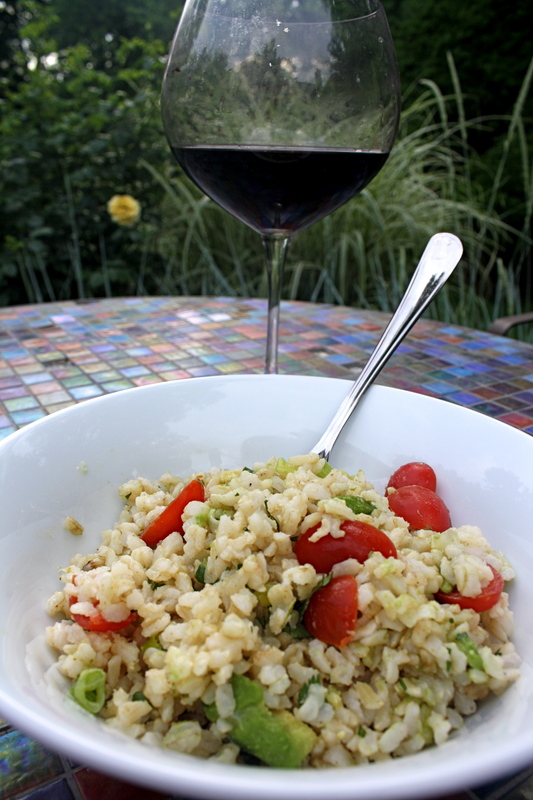 Once the rice is cool, add the scallions, cilantro and tomatoes. Pour the dressing mixture over the rice and gently fold together until the rice is coated. Refrigerate until ready to serve. 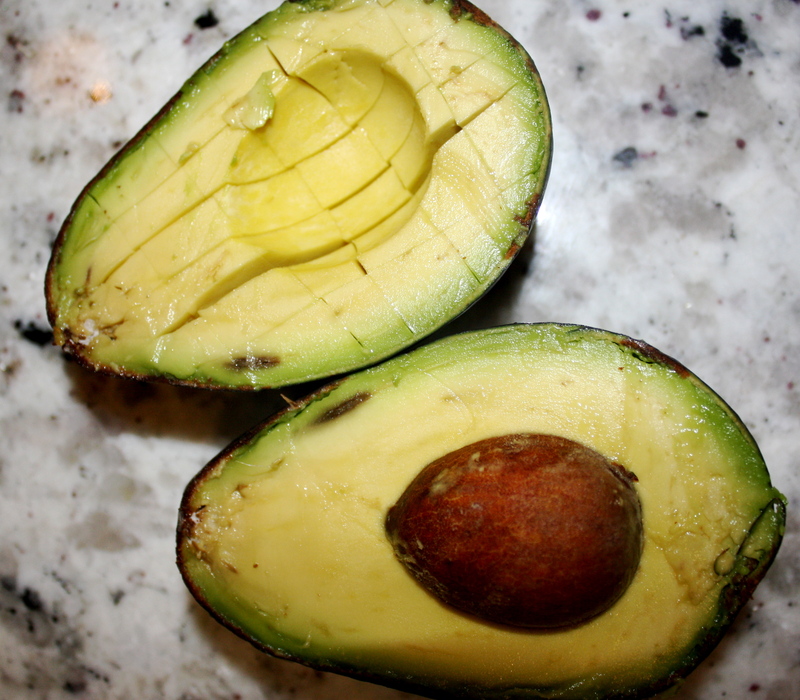 Right before serving, cut up the avocado and gently fold it into the salad. Serve the salad cold or at room temperature. So…kale. Loved by few, hated by many. It’s one of those health foods that we choke down because it’s “good for us.” Now, I’m one of those weird people who actually likes kale, but I realize that many people need alittle (or alot) of something extra to make it palatable. A good friend of mine introduced me to this recipe and it’s my new favorite quick fix for a dinner side salad. The real star of this salad is the walnut dressing you toss it in. 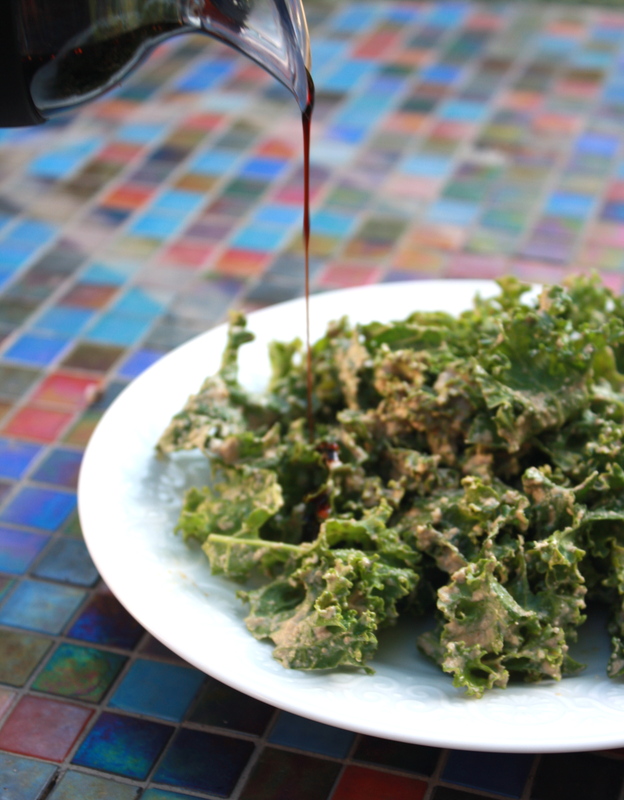 It’s quick and delicious and adds a nutty balance to the kale. Give a couple of ingredients a quick whirl in a blender and its done. While you could stop with the walnut dressing, the salad is really enhanced my a small drizzle of balsamic glaze. It adds just the right amount of sweetness to make this salad even more delicious. Try this salad and you may just change your mind about kale. 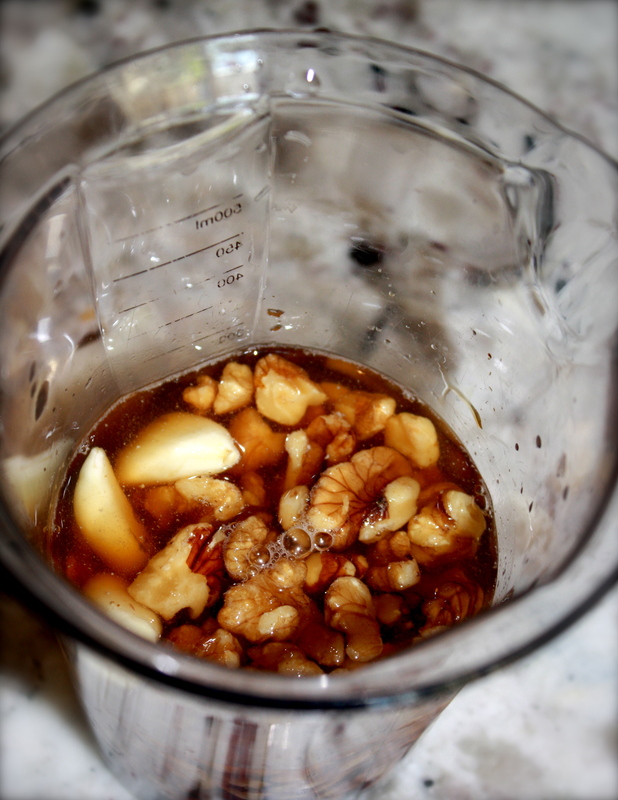 Combine walnuts, garlic and tamari and add 1/4 c water. Blend with a hand blender or machine blender until smooth. If desired, add more water for a thinner texture. 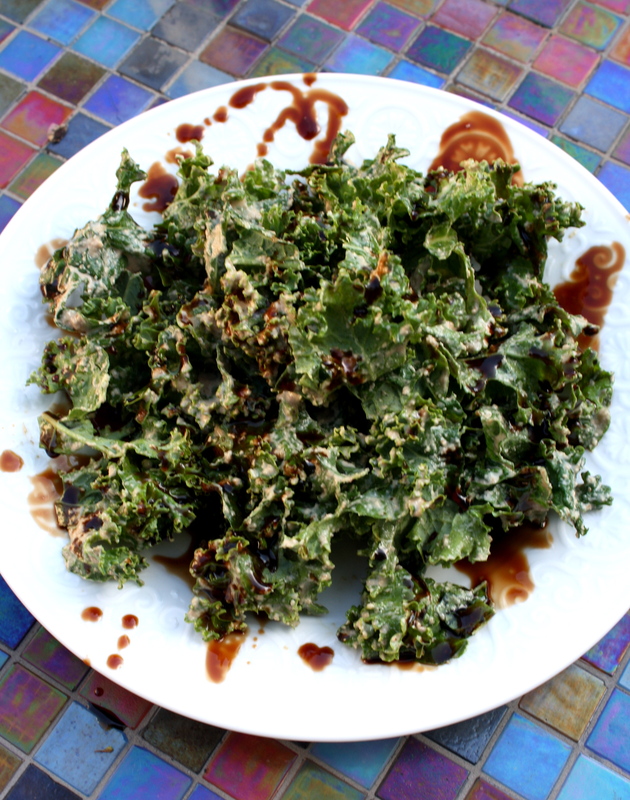 Toss with the kale and serve with a drizzle of balsamic glaze. 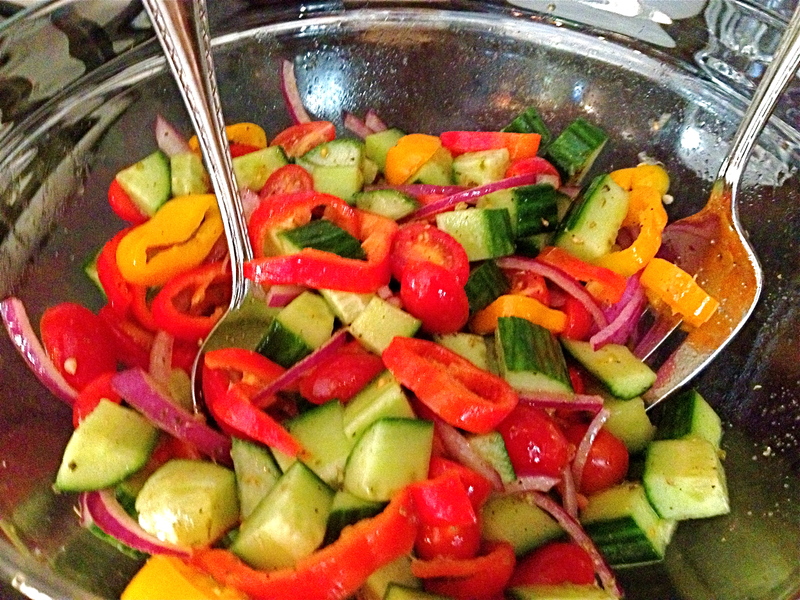 There is something about summer that makes me crave salads. 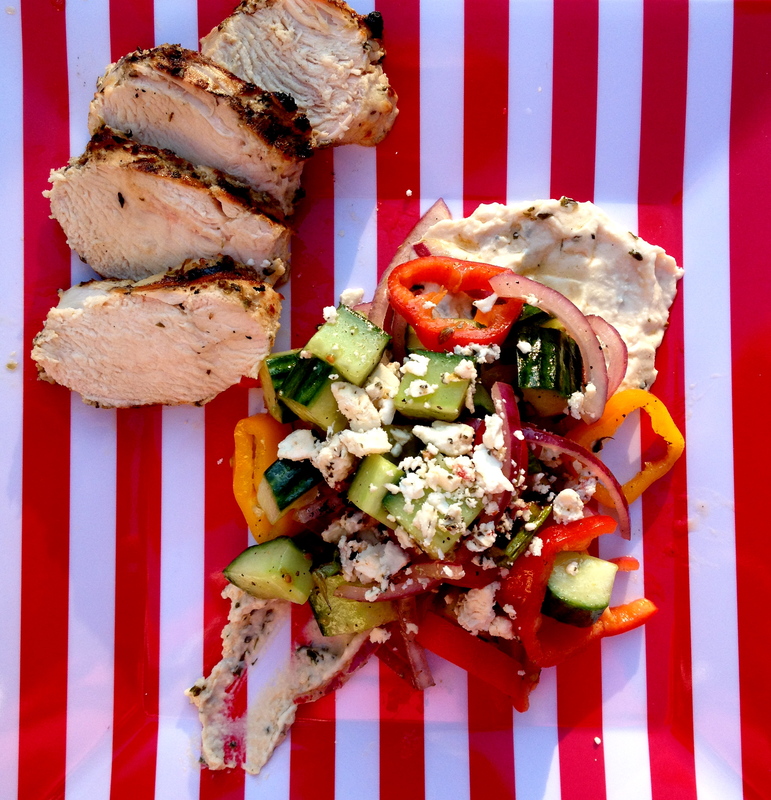 We like to eat outside in the summer so a salad is the perfect cool accompaniment to the warm weather. 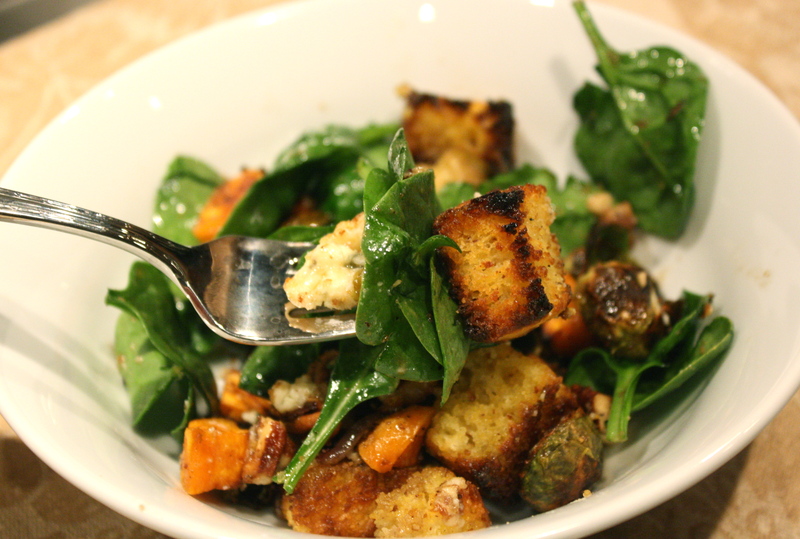 So, when I found the recipe for this salad over at Smitten Kitchen, I knew I had to try it. I made a couple of changes and added a few things to make it more of a complete meal and it was awesome! The hubs even gave me the thumbs up without me fishing for compliments. I really love the vibrant colors in this salad and the feta cheese adds just the right amount of tang and creaminess. The best part of this salad is that it can be made to accommodate a variety of dietary restrictions by simply adjusting or omitting ingredients. For the chicken, combine all ingredients in a shallow dish or plastic bag and allow to marinate at least 2 hours before serving. Preheat grill to high and cook chicken for about 10 minutes per side, depending on the size of the breast. While chicken is cooking, toss the asparagus spears in 1 Tblsp of olive oil. Place on the grill and cook for about 10 min, rotating at least once. Combine remaining vegetables in a large bowl. In a small bowl, wisk together lemon, olive oil and salt and pepper. Pour over the vegetables and toss to coat. Once finished, slice the asparagus spears and add them to the salad. To serve, place 1/4 c hummus on each plate and spoon the vegetables over the top. Sprinkle as much feta cheese as you would like on the vegetables. Slice the chicken breast and serve on the side.